You received flat files or text files or csv files in one of the source folder. You need to write an SSIS Package that should read the file columns and create table and load the data from file. Once data is loading move the file to archive folder. The table will be created with name of file. If already exists, we would like to drop the table and created. We are going to use Script Task in this post to create table dynamically for each flat file and load it. 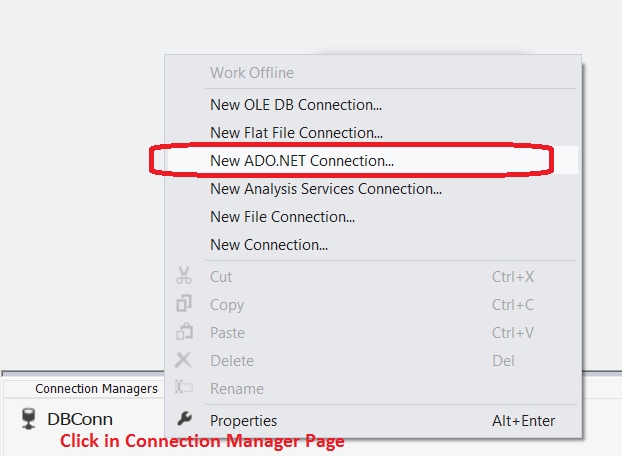 Open SSDT ( SQL Server Data Tools) and create new SSIS Package. After that go ahead and create variables so we can use them in configuration to pass values anytime our requirement change. ArchiveFolder: Provide the folder path where you would like to move files after loading. Datetime part will be added to file name. ColumnsDataType : Provide the data type you would like to use for newly created table/s. SchemaName : Provide the schema name in which you would like to create your table/s. FileDelimiter : Provide the delimiter which is used in your txt or csv files. FileExtension : Provide the Extension of files you would like to load from folder. SourceFolder: Provide the source folder path where text files or csv files are places for import process. Save the script in Script Editor and execute your SSIS Package,It should create new table for each Flat file and then load the data.Once data loading is complete from flat file / csv file, the file will be moved to archive folder after adding datetime to it. Files are archived after adding date time to them. You get tons of text or csv files in one of the Source Folder. You need to load all the files to SQL Server Table. All the flat files has the same number of columns. You would like to also load the file name with data to SQL Server Table. How would you do load file name with data to SQL server Table by using SSIS Package? But in this post we are going to learn how to use script task to handle this situation. We will load the data to table and then archive the files to archive folder after adding datetime to it. Save the script in Script Editor and execute your SSIS Package, It should load the files from Source folder to SQL Server table with file names and move the file to archive folder after loading them. Here are records loaded by package in dbo.Customer table from my sample files. Files are moved to Archive Folder, Date time was added to each file. We get multiple text of csv files from different clients those we need to load to our dbo.Customer table. Not a problem, we can create an SSIS Package that can load multiple text files to SQL Server table and we have already did by using this post.But there is little problem. Each client will not send exact number of columns what we have for our table. Think about that client A sends always file with id, name and dob columns. Client B can send file with Id and Name. Also Client B can send some files with three columns id,name and dob. Client C can also send the file with only column Name and Dob or any other combination. One thing to noticed here, the files can have same columns or less but will never have more columns than SQL Server table. We need to create an SSIS Package that should be able to load these type of files. This package should be like template, that we can use for any type of related requirement and can change destination table name,Source folder, Archive Folder, File Extension and File Delimiter etc. by using SSIS Configuration. Sample data files using for my demo. As you can see that I have three files each one has different combination of columns but all matches with columns of SQL Server table. We will be using Script Task in SSIS Package to load all the text files to SQL Server table with same or less columns than table definition. Save the script in Script Editor and execute your SSIS Package, It should load the files from Source folder to SQL Server table and move the file to archive folder after loading it. Files moved to Archive Folder after datetime added to them as shown below. You are working as ETL Developer / SSIS Developer. You get single or multiple text/csv files in Source Folder on daily basis. You want to create an SSIS Package that should be able to load all the files to single Table and archive after loading to table. 5) File delimiter can also change, let's say you are getting files with comma(,). The file provider can make decision moving forward, he will be provide files with pipe( | ) . We can create an SSIS Package by using built-in Tasks, Transformations and Expressions. But I am moving forward with Script Task in this post. So we can learn some C# scripting language and also handle all the situation in Script Task.